Since it was first proposed in the 1960s to account for all the “missing mass” in the Universe, scientists have been trying to find evidence of dark matter. This mysterious, invisible mass theoretically accounts for 26.8% of the baryonic matter (aka. visible matter) out there. And yet, despite almost fifty years of ongoing research and exploration, scientists have not found any direct evidence of this missing mass. However, according to two new research papers that were recently published in the journal Physical Review Letters, we may have gotten our first glimpse of dark matter thanks to an experiment aboard the International Space Station. Known as the Alpha Magnetic Spectrometer (AMS-02), this a state-of-the-art particle physics detector has been recording cosmic rays since 2011 – which some theorize are produced by the annihilation of dark matter particles. Like its predecessor (the AMS), the AMS-02 is the result of collaborative work and testing by an international team composed of 56 institutes from 16 countries. With sponsorship from the US Department of Energy (DOE) and overseen by the Johnson Space Center’s AMS Project Office, the AMS-02 was delivered to the ISS aboard the Space Shuttle Endeavour on May 16th, 2011. 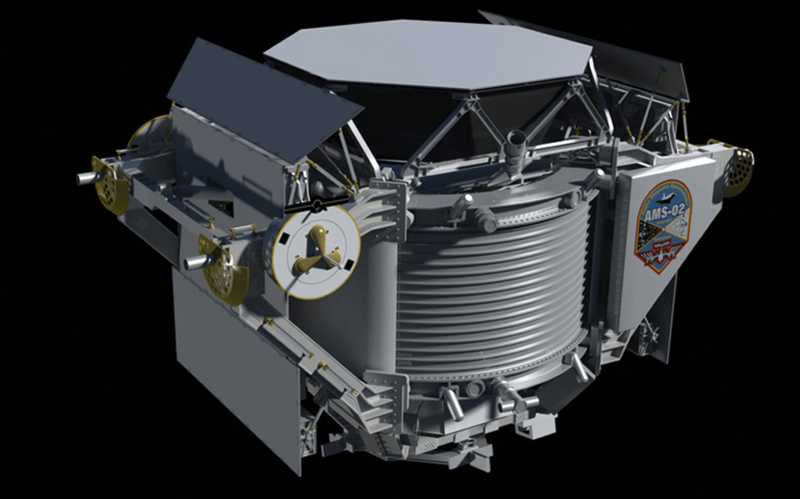 Ostensibly, the AMS-02 is designed to monitor cosmic rays to see how much in the way of antiprotons are falling to Earth. But for the sake of their research, the two science teams also been consulted the data it has been collecting to test theories about dark matter. To break it down, the WIMPs theory of dark matter states that it is made up of Weakly-Interacted Massive Particles (WIMPS), protons and antiprotons are the result of WIMPs colliding. By monitoring the number of antiprotons that interact with the AMS-02, two science teams (who were working independently of each other) hoped to infer whether or not any of the antiprotons being detected could be caused by WIMP collisions. The difficulty in this, however, is knowing what would constitute an indication, as cosmic rays have many sources and the properties of WIMPs are not entirely defined. To do this, the two teams developed mathematical models to predict the cosmic ray background, and thus isolate the number of antiprotons that AMS-02 would detect. They further incorporated fine-tuned estimates of the expected mass of the WIMPs, until it fit with the AMS-02 data. One team, led by Alessandro Cuoco, was made up of researchers from the Institute for Theoretical Particle Physics and Cosmology. Using computer simulations, Cuoco and his colleagues examined the AMS-02 data based on two scenarios – one which accounted for dark matter and one which did not. As they indicate in their study, they not only concluded that the presence of antiprotons created by WIMP collisions better fit the data, but they were also able to constrain the mass of dark matter to about 80 GeV (about 85 times the mass of a single proton or antiproton). According to supersymmetry, dark-matter particles known as WIMPs annihilate each other, creating a cascade of particles and radiation. Credit: Sky & Telescope / Gregg Dinderman. The other team was made up of researchers from the Chinese Academy of Sciences, Nanjing University, the University of Science and Technology of China, and the National Center for Theoretical Sciences. Led by Ming-Yang Cui of Nanjing University, this team made estimates of the background parameters for cosmic rays by using prior data from previous boron-to-carbon ratio and proton measurements. These measurements, which determine the rate at which boron decays into carbon, can be used to guage the distance that boron molecules travel through space. In this case, they were combined with proton measurements to determine background levels for cosmic rays. They incorporated this data into a Bayesian Analysis framework (i.e. a statistical model used to determine probabilities) to see how many antiprotons could be attributed to WIMP collisions. What’s more, both scientific teams obtained similar estimates when it came to cross-section measurements of dark matter – i.e. the likelihood of collisions happening based on how densely dark matter is distributed. For example, Cuoco’s team obtained a cross-section estimate of 3 x 10-26 per cm³ while Cui’s team obtained an estimate that ranged from 0.2 – 5 × 10-26 per cm³. The fact that two scientific teams, which were operating independently of each other, came to very similar conclusions based on the same data is highly encouraging. While it is not definitive proof of dark matter, it is certainly a step in the right direction. At best, it shows that we are getting closer to creating a detailed picture of what dark matter looks like. While scientists have attempted to find evidence of dark matter by monitoring cosmic rays in the past, the AMS-02 stands apart because of its extreme sensitivity. As of May 8th, the spectrometer has conducted measurements on 100 billion particles. As of the penning of this article, that number has increased to over 100,523,550,000! For almost a century, astronomers and cosmologists have postulated that space is filled with an invisible mass known as “dark matter”. Accounting for 27% of the mass and energy in the observable universe, the existence of this matter was intended to explain all the “missing” baryonic matter in cosmological models. Unfortunately, the concept of dark matter has solved one cosmological problem, only to create another. If this matter does exist, what is it made of? So far, theories have ranged from saying that it is made up of cold, warm or hot matter, with the most widely-accepted theory being the Lambda Cold Dark Matter (Lambda-CDM) model. However, a new study produced by a team of European astronomer suggests that the Warm Dark Matter (WDM) model may be able to explain the latest observations made of the early Universe. But first, some explanations are in order. The different theories on dark matter (cold, warm, hot) refer not to the temperatures of the matter itself, but the size of the particles themselves with respect to the size of a protogalaxy – an early Universe formation, from which dwarf galaxies would later form. The size of these particles determines how fast they can travel, which determines their thermodynamic properties, and indicates how far they could have traveled – aka. their “free streaming length” (FSL) – before being slowed by cosmic expansion. Whereas hot dark matter would be made up of very light particles with high FSLs, cold dark matter is believed to be made up of massive particles that have a low FSL. 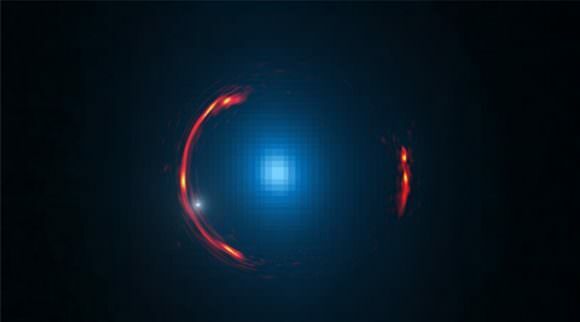 Cold dark matter has been speculated to take the form of Massive Compact Halo Objects (MACHOs) like black holes, or a class of undiscovered heavy particles – i.e. Weakly-Interacting Massive Particles (WIMPs), and axions. The widely-accepted Lambda-CDM model is based in part of the theory that dark matter is “cold”. As cosmological explanations go, it is the most simple and can account for the formation of galaxies or galaxy cluster formations. However, there remains some holes in this theory, the biggest of which is that it predicts that there should be many more small, dwarf galaxies in the early Universe than we can account for. In short, the existence of dark matter as massive particles that have low FSL would result in small fluctuations in the density of matter in the early Universe – which would lead to large amounts of low-mass galaxies to be found as satellites of galactic halos, and with large concentrations of dark matter in their centers. Naturally, the absence of these galaxies might lead one to speculate that we simply haven’t spotted these galaxies yet, and that IR surveys like the Two-Micron All Sky Survey (2MASS) and the Wide-field Infrared Survey Explorer (WISE) missions might find them in time. But as the international research team – which includes astronomers from the Astronomical Observatory of Rome (INAF), the Italian Space Agency Science Data Center and the Paris Observatory – another possibility is that dark matter is neither hot nor cold, but “warm” – i.e. consisting of middle-mass particles (also undiscovered) with FSLs that are roughly the same as objects big as galaxies. In other words, they found that the WDM could better account for the early Universe as we are seeing it today. Whereas the Lambda-CDM model would result in perturbations in densities in the early Universe, the longer FSL of warm dark matter particles would smooth these perturbations out, thus resembling what we see when we look deep into the cosmos to see the Universe during the epoch of galaxy formation. 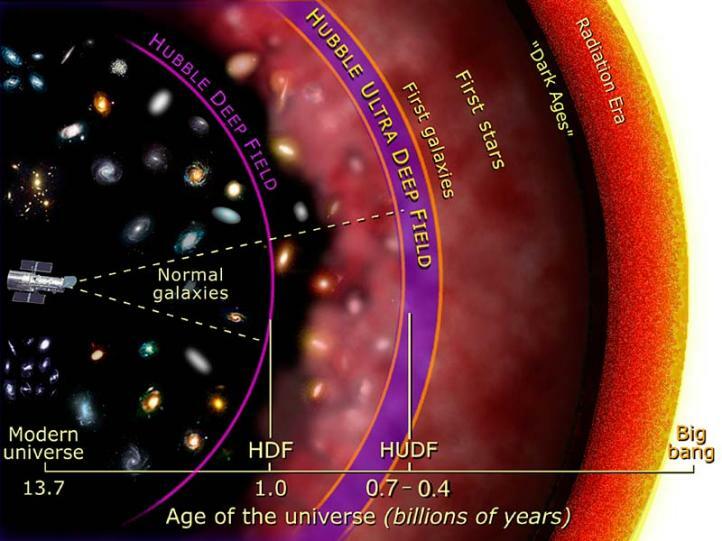 For the sake of their study, which appeared recently in the July 1st issue of The Astrophysical Journal Letters, the research team relied on data obtained from the Hubble Frontier Fields (HFF) program. Taking advantage of improvements made in recent years, they were able to examine the magnitude of particularly faint and distant galaxies. “Since galaxy formation is deeply affected by the nature of DM on the scale of dwarf galaxies, a powerful tool to constraint DM models is to measure the abundance of low-mass galaxies at early cosmic times (high redshifts z=6-8), the epoch of their formation. This is a challenging task since it implies finding extremely faint objects (absolute magnitudes M_UV=-12 to -13) at very large distances (12-13 billion of light years) even for the Hubble Space Telescope. The results they obtained provided strict constraints on dark matter and early galaxy formation, and were thus consistent with what HFF has been seeing. These results could indicate that our failure to detect dark matter so far may have been the result of looking for the wrong kind of particles. But of course, these results are just one step in a larger effort, and will require further testing and confirmation. Looking ahead, Menci and his colleagues hope to obtain further information from the HFF program, and hopes that future missions will allow them to see if their findings hold up. As already noted, these include infrared astronomy missions, which are expected to “see” more of the early Universe by looking beyond the visible spectrum. For almost a century, dark matter has been a pervasive and elusive mystery, always receding away the moment we think we about to figure it out. But the deeper we look into the known Universe (and the farther back in time) the more we are able to learn about the its evolution, and thus see if they accord with our theories. The standard model of cosmology tells us that only 4.9% of the Universe is composed of ordinary matter (i.e. that which we can see), while the remainder consists of 26.8% dark matter and 68.3% dark energy. As the names would suggest, we cannot see them, so their existence has had to be inferred based on theoretical models, observations of the large-scale structure of the Universe, and its apparent gravitational effects on visible matter. You can read more about the research in Physical Review D or in preprint form on Arxiv. We’re still mostly in the dark about Dark Matter, and the highly anticipated results from the XENON100 detector has perhaps shed a tad more light on the subject – by not making a detection in the first 100 days of the experiment. Researchers from the project say they have now been able to place the most stringent limits yet on the properties of dark matter. To look for any possible hints of Dark Matter interacting with ordinary matter, the project has been looking for WIMPS — or weakly interacting massive particles – but for now, there is no new evidence for the existence of WIMPS, or Dark Matter either. The extremely sensitive XENON100 detector is buried beneath the Gran Sasso mountain in central Italy, shielding it from cosmic radiation so it hopefully can detect WIMPS, hypothetical particles that might be heavier than atomic nuclei, and the most popular candidate for what Dark Matter might be made of. The detector consists of 62 kg of liquid xenon contained within a heavily shielded tank. If a WIMP would enter the detector, it should interact with the xenon nuclei to generate light and electric signals – which would be a kind of “You Have Won!” indicator. Dark Matter is thought to make up more than 80% of all mass in the universe, but the nature of it is still unknown. Scientists believe that it is made up of exotic particles unlike the normal (baryonic) matter, which we, the Earth, Sun and stars are made of, and it is invisible so it has only been inferred from its gravitational effects. The XENON detector ran from January to June 2010 for its first run, and in their paper on arxiv, the team revealed they found three candidate events that might be due to Dark Matter. But two of these were expected to appear anyway because of background noise, the team said, so their results are effectively negative. Does this rule out the existence of WIMPS? Not necessarily – the team will keep working on their search. Plus, results from a preliminary analysis from11.2 days worth of data, taken during the experiment’s commissioning phase in October and November 2009, already set new upper limits on the interaction rate of WIMPs – the world’s best for WIMP masses below about 80 times the mass of a proton. And the XENON100 team was optimistic. “These new results reveal the highest sensitivity reported as yet by any dark matter experiment, while placing the strongest constraints on new physics models for particles of dark matter,” the team said in a statement. WIMPs are Weakly Interacting Massive Particles, hypothetical particles which may be the main (or only) component of Dark Matter, a form of matter which emits and absorbs no light and which comprises approx 75% of all mass in the observable universe. The ‘weakly’ is a bit of a pun; WIMPs would interact with themselves and with other forms of mass only through the weak force (and gravity); get it? More plays on words: WIMP, the word, was created after the term MACHO (Massive Astrophysical Compact Halo Object) entered the scientific literature. WIMPs are massive particles because they are not light; they would have masses considerably greater than the mass of the proton (for example). Being massive, WIMPs would likely be cold; in astrophysics ‘cold’ doesn’t mean ‘below zero’, it means the average speed of the particles is well below c. Neutrinos are weakly interacting particles, but they are not massive, so they cannot be WIMPs (besides, neutrinos aren’t hypothetical, and they’re hot, very hot … they travel at speeds just a teensy bit below c). Or maybe they are … if there is a kind of neutrino which is really, really massive (a TeV say) then it would certainly be a WIMP! However, the latest results from WMAP seem to rule out this kind of WIMP-as-neutrino. There are quite a few experiments – active or planned – looking for WIMPs; some Universe Today stories on them are New Proposal to Search for Dark Matter, Searching for Dark Matter Particles Here on Earth, Digging for Dark Matter, the Large Underground Xenon (LUX) Detector, and A Prototype Detector for Dark Matter in the Milky Way. It may turn out that WIMPs remain entirely hypothetical (the particles which comprise Dark Matter may not be WIMPs, for example) or only a minor component of Dark Matter. In the latter case they’d follow MACHOs not only because they were named at a later time … MACHOs have been detected in the Milky Way halo, but there aren’t anywhere near enough of them to account for the rotation curve of our galaxy. This section of a review by Princeton University’s Dave Spergel is rather old but still one of the best concise technical descriptions; and this Particle Data Group review (PDF file) lists WIMP searches (though it’s a bit dated). NASA’s Imagine the Universe! has a page on Possibilities for Dark Matter that includes a simple overview of WIMPs. Want to hear, rather than read, more? Check out the Astronomy Cast episode The Search for Dark Matter!